One bad habit that is easy to fall into as a solo developer (especially under a time constraint) is to rationalize ignoring or delaying proper documentation since you're the only one working in the codebase it is easy to think that documentation is unimportant. And it is. Until it isn't - and then it is really important. So that is one area that I am constantly trying to improve in. 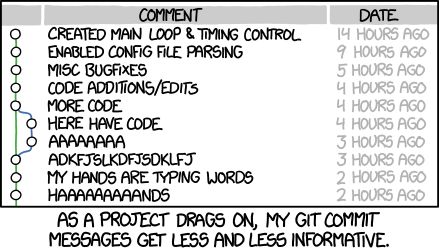 A git commit message is an oft-overlooked and undervalued form of documentation, so how can we improve here? I had already been, for the most part, following The seven rules of a great Git commit message. They made sense and were easy enough to implement, and almost got me to where I wanted to be as far as git commit messages were concerned. I have added husky + commitizen + commitlint to our projects and it has been great. Some benefits include an auto-generated change log. auto-incrementing semantic versioning. and increased visibility for breaking changes. I would recommend it for every project. Because we are using gitlab, we are using these packages semantic-release-gitlab and npm-publish-git-tag. So I got to googling and found the How We Use Commitizen to Clean Up Commit Messages post that I used for a starting point on implementing and enforcing conventional commit messages. The only problem was that the vast majority of my projects are PHP projects, and these are all npm packages. As much as I wanted to add this to my workflow, I wasn't keen on the idea of adding a package.json file to each project and adding unnecessary complexity to my dev process. So I went about discovering if these tools could be added globally so they could be added to my ~30 projects without configuring them individually for each project. commitizen is a handy little command line utility that provides prompts and hints for filling out each section for a conventional commit message. If you want to add newlines you can add them with the `\n` newline character. The dashes create a bullet list. Yes, this is an ugly work around, but the only way that I found that works, and not a deal breaker, for me. Now that commitizen is installed and working, we can move on to the next step. commitlint is a tool that will lint your commit message and let you know if it adheres to whatever standard you've chosen. commitlint in and of itself does not really do much until it is placed into a git hook. It is from inside this hook that we can fail the commit if the message does not follow the standard. Like the earlier npm packages, I wanted this applied to all of my projects, without configuring a git hook for each individual project. If you are unfamiliar with using git hooks globally, you can check out my previous post on git global hooks. So there you have it, three easy steps to set up a conventional commit message workflow. This is most useful if you can get in the habit of making atomic commits. You can see the real beauty of this after making a few commits and then running git log --one-line. Give it a shot and see what you think!